Streit's Matzo Factory, a photo by SHOTbySUSAN on Flickr. 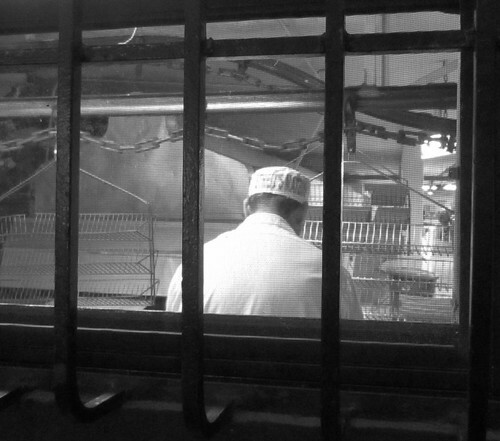 Making matzos at Aron Streit - unchanged since 1916. You can see a stack of matzo crackers on the conveyor belt - lower right. If you call Streit's, they'll give you a free tour. In the 1890's, Aron Streit and his wife, Nettie, left Europe and came to America. In 1916, Aron opened his first matzo factory. There, on Pitt Street on the Lower East Side of Manhattan, Aron and his first partner Rabbi Weinberger made all their matzo by hand. In 1925, Aron and one of his sons opened up a modern bakery in the same building on Rivington Street where Streit's stands today. A few years later, Aron's other son joined the business. With the family working together, the Streit matzo bakery prospered and Aron bought three adjoining buildings to handle the growing business. Streit's still occupies the same four buildings on Rivington Street where Aron and his sons started baking matzos more than seventy years ago. And the matzo bakery is still a family business. Today, Aron's granddaughters and great-grandsons run the company. Streit's is the only family-owned and operated matzo company in America.